Frank Vincent : Hilo and, Madras, 1876. Through and Through the Tropics, Thirty Thousand Miles of Travel in Oceanica, Australasia, and India. Harper and Brothers, New York, 1876. .
ON the 24th of October, 1869, the stanch old clipper ship Golden Fleece, of fifteen hundred tons' burden, left the port of New York on a trading voyage around the world, her more immediate destination being San Francisco via Cape Horn. FROM San Francisco to the Hawaiian or Sandwich Islands the distance is about two thousand miles. One may visit them either in a steamer or sailing-vessel, the time required in the former being one week, and in the latter two or three. The Golden Fleece, being bound for Hong Kong and Manilla, proposed calling at Honolulu, merely to obtain some extra freight. We left 'Frisco on the 26th of March, and during the first day out made the splendid run of two hundred and sixty-nine miles. On the 10th of April, after an uninteresting voyage, we sighted one of the Hawaiian group the island of Molokai. It lies to the east of Oahu, and is simply a long, narrow strip of land, with low rocky hills in the interior, and barren, undulating plains stretching to the coast. The first view of Oahu was not more inspiring. Instead of vast groves of palms, oranges, bananas, and other tropical trees and plants, we beheld sharp, rugged hills, without shrubs or grass. The whole island was of volcanic formation. fiery once, but now solid as the eternal rock. At the water's edge were large, dark holes, wave-eaten, and probably leading to extensive caverns. Suddenly, on rounding Diamond Head (an old extinct crater a thousand feet in height), we saw, six miles distant, the pretty little town of Honolulu. It nestled in a sunny green valley, between cliffs whose heads were hidden in the trade-wind's silver clouds. A pilot, who had just guided a whaler out to sea, came on board and took us to a safe anchorage. The town or "city," as it is styled by legal enactment lies upon a plain at the opening of the beautiful valley of Nuuanu, which bisects the island of Oahu, and in the centre of a large semicircle of high lands that incloses the harbor. The situation is pleasant, facing the south, upon ground sloping from the mountains down to the bright blue water. The climate, though warm, is salubrious,the heat being tempered by the surrounding sea and the northeast trade-winds. From our anchorage, at two miles' distance, Honolulu showed to much advantage, the little huts being shaded by a goodly quantity of rich green foliage. and other of the South Sea Islands. It was a hard pull in the captain's gig toward the shore, for a heavy sea was driving us through the mouth of the harbor a single narrow opening in the coral reef which extends from headland to headland. fresh water being so inimical to the coral insects that they always suspend building operations whenever it makes its appearance in great volume. Within the semicircle mentioned the anchorage is safe, though the sea dashes with force against the reef. At anchor near by lay the United States sloop-of-war Jamestown, and a large frigate bearing the Austrian ensign. Hilo, seen from the sea, is not very attractive. The houses are mostly concealed by the foliage. It has no harbor ; in fact the only harbor of the islands is that of Honolulu. At Hilo vessels are obliged to load and un- load by means of their boats, having first been made fast to a buoy. The waves, excepting in one single place, dash high over the coral reef in clouds of foam. AT HOME WITH THE KANAKAS. HAWAIIANS are accustomed to pass half of life on or in the sea. It was at Hilo that I first inspected some of the native canoes. They are usually made from the trunks of the cocoa-nut or koa trees, which are hollowed out by means of fire, and are so narrow that it is just possible for a man to kneel in them, as he is obliged to do while paddling. Their bottoms and sides are so nearly round that an outrigger is necessary to hold them in place. This consists of two slender timbers, each ten feet long, attached at right angles to one side of the canoe, and joined at their outer extremities by a long, curved, and sometimes carved piece of wood which rests upon the water. This appendage, while it gives security by increasing the beam, does not sensibly impede the progress of the canoe, nor render the paddling more difficult to an apt and nimble native. You will not always find the Kanakas, therefore, by looking for them in their little straw-thatched huts under the cocoa-nut palms. The sea is equally their residence. A Kanaka seems to have no fear of the voracious sharks which infest his beautiful archipelago, and sometimes he even kills one in single combat in the water. with his long, sharp knife, and taking advantage of the fact that the shark has to turn upon his back before seizing his prey, the Kanaka dives and stabs the monster from beneath. Natives have frequently been known to remain in the sea twenty-four hours at a time, and to swim distances of twenty and even thirty miles. Surf-bathing is freely indulged in by the youth of both sexes at the same time and place. Among the many ancient national games, that of heenalu (riding on surf- boats) is almost the only one universally retained. The swimmers start from the shore, carrying with them their surf-boards, flat pieces of wood adapted in size to the muscular strength of each, and usually four or five feet in length and one or two in width. The party then proceeds seaward until the outermost line of breakers is reached, sometimes half a mile from shore, and then, lying upon their boards, are carried toward land with terrific speed. But just as an observer might fancy them about to be dashed against the rocks, they slip from their boards by a dexterous movement, dive beneath the foaming surge, and swim out again seaward to repeat the feat. In this manner they will often amuse themselves for half a day at a time. Madras, the third city of Hindostan in respect to population, stands in a plain on the shore of the Bay of Bengal. It is the capital of the presidency of the same name, and is the chief commercial port of the Deccan, or the South. The inhabitants, seven hundred and twenty thousand in number, are styled Madrasses. They speak the Tamil language, which is extremely difficult for a European to learn. Madras extends for nine miles along the coast, with a breadth of four miles. To one who has seen Calcutta, Benares, Agra, and Umritsur, it contains nothing of interest beyond Fort St. George, the Government House, and the Park. visit Tanjore, Mahabalipoor, Vellore, Bangalore, Mysore, and Mercara, to most of which places I bore letters of introduction that would have been useful to me; but the hot weather was at hand and hurried my departure. A drive of three miles brought me to the seashore, where I hired a masullah in which to reach the steamer, two miles distant. The masullah is a large surf-boat, sharp at both ends, and sewn together by coir rope. This enhances its flexibility, and so prevents its breaking when thrown violently by the waves upon the beach. The ten men who usually propel it employ for oars light, springy poles twenty feet long, each tipped with a blade or oval paddle scarcely larger than the open palm. While rowing the men chant lively and bizarre refrains. We passed safely through the furious surf, with its three lines of rollers, and reached the Oriental in less than twenty minutes. We were advertised to leave at ten, and about that hour the catamarans, another species of native craft, shot off in fleets from the shore to the steamer, their occupants carrying letters and dispatches in their turbans, which were almost all they had on. These curious rafts consist of three firmly lashed cocoa-tree logs, fifteen feet long, somewhat flattened upon the upper surface, and curving upward at the prow. Upon this boat or raft one or two men kneel, or rest on their haunches, and propel themselves by means of a flat, thin piece of wood about four feet in length. by the incessant sweeping over them of the waves ; but as the native's mail-bag is invariably his turban, and as he remains imperturbably in his place, both mail and carrier are preserved. 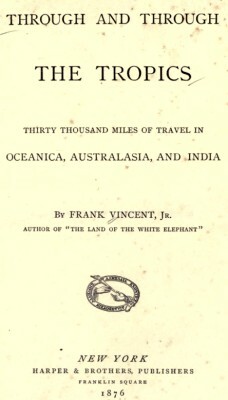 Thirty Thousand Miles of Travel in Oceanica, Australasia, and India. Geoff Cater (2012) : Frank Vincent : Hilo and Madras, 1876.